The German edition of the Funding Atlas 2018 will be published on 5 July 2018 and will be presented at a joint press conference given by the German Research Foundation, the German Rectors’ Conference and the Donors’ Association for the Promotion of Sciences and Humanities in Germany. 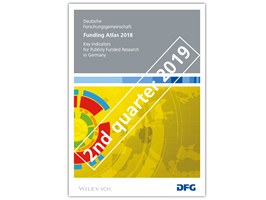 Published every three years, the DFG Funding Atlas presents comprehensive, subject-by-subject key figures relating to publicly funded research in Germany. The English version is provisionally scheduled to appear in the second quarter of 2019. With analyses including detailed breakdowns by subject area, the DFG Funding Atlas is the standard reference work on the success of German universities in obtaining third-party funding and more than just a simple university ranking. The DFG Funding Atlas presents data on third-party funding acquisition not only from the DFG but also in the form of direct R&D funding from the federal government and through Horizon 2020. This includes both overall figures and data for individual subject and funding areas. For DFG grants, the data is also calculated in relation to staff size and analysed in a way that reflects the particular subject-area profile of individual institutions (third-party funding data is ‘corrected’ for subject structure). In addition to the standard data presented in the report, the Funding Atlas 2018 features special analyses on two particular topics. Firstly, to mark ‘50 Years of Collaborative Research Centres’, the report presents a brief introduction to the history of this funding instrument and a number of special analyses illustrating the success of the programme. Secondly, the topic of ‘Research Funding in a European Context and Worldwide’ looks at the position of Germany in the European Research Area and also that of the UK and the challenges associated with Brexit. Regional profiles and maps depicting them have always been a fixed analytical feature of the atlas series. By analysing large-scale structures in the form of ‘spatial development regions’, the Funding Atlas identifies regional focuses and illustrates the networks that interconnect German research institutions and universities. The print and online versions of the report are supplemented by an extensive set of tables (XLS format), enabling readers to use the data reported in the DFG Funding Atlas for their own purposes. Key figures are also prepared for over 80 universities and presented in the at-a-glance university views. New interactive map views developed especially for this Funding Atlas, allow users to view publicly funded research in individual federal states and regions according to individually specified selection criteria. This report and the information offered online were produced with the kind support of the Stifterverband.